These Floorboard Extensions are a simple and inexpensive way to solve many rider issues. Many riders experience hip, knee and ankle stress while riding because of the close placement of the stock floorboards. These footboard extenders will give you a significantly better riding position, which means a MORE COMFORTABLE RIDE. These Extensions are guaranteed to greatly increase your riding comfort or your money back. Now... NO MORE burning your boot on the exhaust pipe, NO MORE sore legs, NO MORE fighting to keep your feet on the floorboards at highway speeds. And what can I say, a wider floorboard position makes your Harley look even FAT’R and MEAN’R. 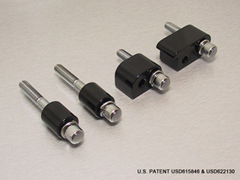 DRIVER EXTENSION KIT FOR 2009-2018 FL TOURING MODELS - BLACK (FOR STOCK BLACK BRACKETS) - WILL NOT FIT 2014 TRIKES w/ PARKING BRAKE - SEE BELOW. 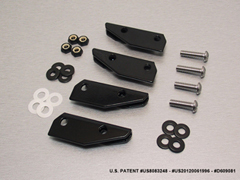 For 2009+ FL Harley Touring Models with stock black floorboard brackets. 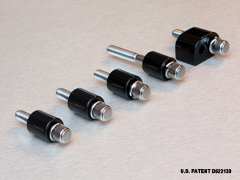 DRIVER EXTENSION KIT FOR 2014+ FL TOURING TRIKE MODELS - BLACK - WILL ONLY FIT TRIKE MODELS. For 2014+ FL Harley Touring TRIKE Models - Driver. 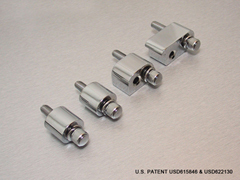 For 2009+ FL Harley Touring Models non-CVO with chrome plated stock floorboard brackets. (not recommended for stock black brackets). For 2009+ FL Harley Touring SCREAMIN EAGLE Models. 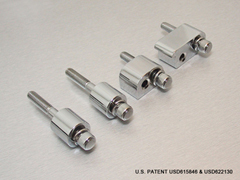 Please note that the CVO and non-CVO hardware is not interchangeable. For 2012+ FL Harley Touring SCREAMIN EAGLE Models. For 1983-2008 FL Harley Touring Models. Hardware fits 1993-2008. For models 83-92 please request fine thread bolts. 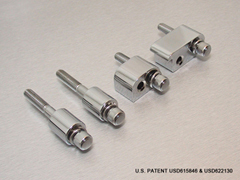 For 1983-2008 FL Harley Touring Models w/ chrome brackets and CVO models. For 2000-2008 FL Harley Screamin Eagle (CVO) Models models. 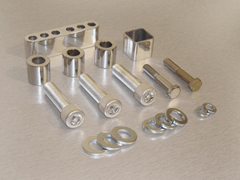 For 1986-1999 FL Harley Softail Models with Driver Floorboards, ships standard with stainless steel fasteners. For 2000+ FL Harley Softail Models with BLACK Driver Floorboards. All fasteners are grade 8 BLACK zinc plated unless otherwise requested.